Harman is renowned for their premium quality JBL home theater systems. 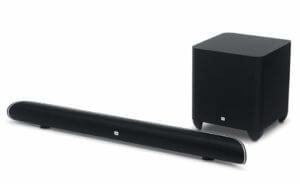 Their latest soundbar JBL Cinema SB450 comes with stunning 4K soundbar and wireless subwoofer. Like previous JBL product line, this soundbar boasts of extraordinary audio and acoustic performance. Here is a quick JBL Cinema SB450 review to explore specifications, features and performance of the latest home theater soundbar. With JBL Cinema SB450 UHD soundbar, you can squeeze full juice out of your 4K television. The soundbar works great with 4K Ultra-HD televisions and A/V receivers, amplifying the rich sound of 4K Ultra-HD contents. The soundbar also sports HDR (High Dynamic Range) to enhance the sound staging, ensuring clear distinction of quietest and loudest audio waves. The soundbar offers of clear and crisp sound, music sounds are rich and movie dialogues and actions are enhanced. Virtual Surround Sound is another innovative feature of the Cinema SB450, delivering realistic surround sound from the soundbar without need of additional bookshelf speakers. The compact, yet powerful 8-inch 200W wireless subwoofer produces rich and deep bass and being a wireless subwoofer, it provides a lot of freedom and can be placed at any convenient location in the room. This UHD soundbar features a number of connectivity options, with 3 HDMI inputs channels, the soundbar acts as a hub that can connect 4K devices. The Cinema SB450 processes 4K contents and sends out through the single HDMI output channel. In addition to wired HDMI connections, the JBL Cinema SB 450 permits phones to connect wireless and stream audio via Bluetooth technology for bigger and awesome sound. With JBL’s SoundShift technology, you can seamlessly alternate between sounds from the TV and smartphones. The Cinema SB450 is easy to setup and use, with much useful Remote Control Learning feature, you can eliminate the need for yet another remote control by using the TV’s remote control to operate the soundbar. However, for more sound options and control, you can use the JBL remote control that comes with the soundbar. The Cinema SB450 is JBL Connect enabled, this allows it to pair with other JBL Connect enabled speakers and enhance the audio experience. The theater quality immersive acoustics of the JBL Cinema SB450 soundbar, coupled with the variety of connectivity options and modern innovative features makes this soundbar a very capable addition to your home theater setup. Stream Bluetooth audio simultaneously to the JBL Cinema SB450 and any other JBL Connect-enabled device for an amplified listening experience. I have been admiring this system since 2016 and i have compared it with other sound bars at best buy .